On July 7th, 2015, we are very fortunate to have Matias del Campo of University of Michigan join us for a lecture event. 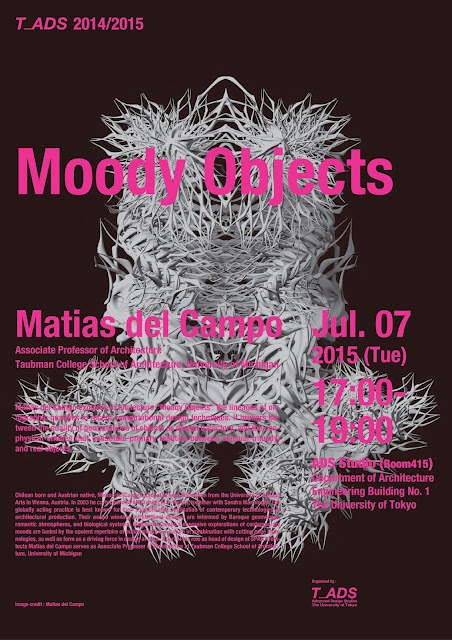 It will be held in the ADS Studio, in room 415 of Engineering Building #1 on Hongo Campus from 17:00-19:00 on July 7th. The event is open to the public, so please feel free to join. Matias del Campo explores in his lecture "Moody Objects" the lineages of ontographic qualities in recent computational design techniques. It brokers between the quality of permutations of objects as design trajectory, and the nonphysical entities that constitute primary realities between sensual (moody) and real objects.